It is pretty well known that pest control, by nature, is simply a reactive activity for the most part. When you discover that you have a pest problem, you then figure out a way in which you can control it. However, while this may seem to have worked up until this point, there is a trick to pest control and that trick is to do it proactively, rather than to simply take care of the problem when it arises. Having a proactive pest control plan means that instead of waiting for a full-blown infestation to take place and then driving the bugs or rodents out of your home, you make sure that they never are able to infest your property at all. Seeing as how we are in the swing of spring, there truly is no better time to begin taking preventative measures when it comes to protecting your home from pests. So how can you do that? We would suggest that you start by following the tips listed below. These will allow for you to have a permanently pest-free home if you complete them properly. The first thing you should do when you are trying to protect your home from pests is to prevent them from having access to the interior of your home. Most pests will use the same sort of access points to first infiltrate your home and then subsequently infest it. The best way you can prevent this from happening is to find and then seal these access points. The most common places pests will enter your home is through your window sill, door frames, and any other thresholds you may have. A crack or crevice does not have to be that big for a bug or rodent to squeeze through and gain access to your home. Additionally, you should make sure that all of your windows and doors are installed and placed properly from the get-go. Always use caulk to seal any gaps or cracks that you may come across and always be aware of drafts. If you feel a draft near a window or door, that means there is a gap that is definitely large enough for a pest to fit through. You will also want to check the baseboarding, foundation, insulation, and any walls or floors that may be unfinished. Remember, while a small hole or gap may not seem like a big deal to you, it is likely a space that can easily allow pests into your home. It seems that in each and every blog post we seem to be telling homeowners to make sure that they need to take their trash out if they want to avoid having a pest problem. So it is no wonder that we have to mention it in this blog as well. People use trash cans in the same way in nearly every household. You throw trash in the nearest receptacle anytime you need to get rid of it. There it sits until the trash can is full and then it is removed. However, the problem is that the trash does not disappear when it sits in the can. While this may not seem like such a big deal to you, it certainly is a big deal to pests that have very keen senses and will go out of their way to locate the source of the trash. Rats, mice, and bugs can all smell your garbage, even if you are not able to. Keeping this in mind, it’s important that you keep your garbage in a sealed plastic bag while it is still inside your home. Additionally, be sure to clean out your containers every now and then to make sure there is no residue in the bottoms of the cans that may attract pests. Access to water is one of the main things pests need in order to survive. So it is no wonder that older homes have more pest problems than newer ones. With older piping and a weaker foundation, pests have much more access to water in spaces that have been built for decades. In order to control the moisture in your home, you’re going to need to start on the exterior. Start by making sure that your gutter, storm drains, and downspouts are not clogged and that they are working the way they should be. When you have proper drainage, it will keep water from seeping into your home. You will also want to ensure that your sump pump is working and transferring excess groundwater away from the foundation of your home. Lastly, make sure that you are checking your pipes, toilets, faucets, and sinks for leaking. And if you really want to make sure there is no excess moisture in your home, a dehumidifier is always a good investment. Besides food and water, pests really like to infest places that offer a lot of shelter to them. For instance, pests like centipedes, rodents, cockroaches, and stink bugs will spend hours in their shelter simply hiding out. Keeping this in mind, it’s important that you do not have a ton of clutter around your home as the safer a pest feels in your space, the more often they are going to occupy it. If you do have a fair amount of clutter in your home, you need to take care of it if you want to prevent your home from being infested. It is also a good idea to make sure that your yard is not unkempt as this is just another kind of clutter that pests will be attracted to. If you live in Sacramento and you want to make sure that you do not have to deal with pest infestations in the future, you need to hire your local exterminator. 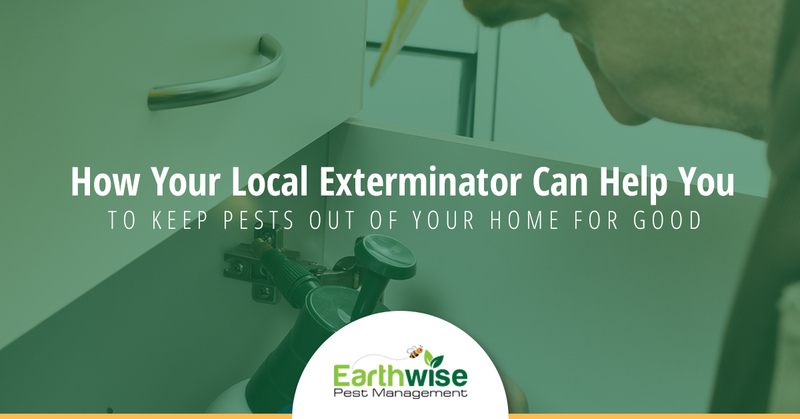 At Earthwise Pest Management, we know how to exclude pests from your home as well as how to get rid of any that may currently be residing there. Contact us right now to learn more about our services!